You can own one of the best selling Gabor wigs available today with the Acclaim Luxury. This beautiful hairstyle will provide you with the most comfortable experience in existence for wigs today. The monofilament top features hand tied kanekalon flexlite hair fibers for ultimate flexibility in terms of styling. The off the face styling enhances this classic cut and takes it to an entirely new level. The soft wave of layers throughout the Acclaim Luxury wig come together in the back for a beautifully blended tapered nape. The cap construction this wig provides you with is unparalleled. You’ll never have to worry about any type of discomfort or irritability plaguing your scalp. Go about your day in style and comfort at all times. Available in the finest salon inspired colors to choose from, you’ll find the right color for you easily. Change it up, and try something new! 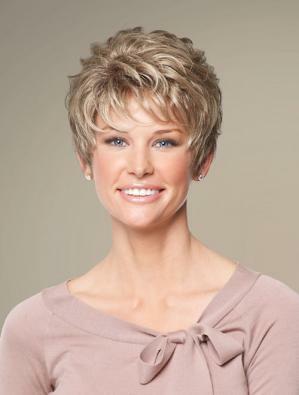 The Acclaim Luxury by Gabor Wigs is worth every penny you spend. Add it to your cart today, and be pleasantly satisfied after trying it on for the first time.